These rich, creamy chocolate treats look and taste impressive, but they’re about as easy as whipping up a batch of cookies. Pair them with a Champagne Cocktail or a French 75. In a double boiler or metal bowl set on top of a pot of simmering water, melt chocolate pieces, cream, and butter over medium heat, stirring constantly. When melted, add powdered sugar, orange oil, vanilla, and Champagne, continuing to stir until smooth and thick. Remove from heat and let the chocolate mixture cool at room temperature for 10 minutes. Cover and refrigerate for another 15 minutes, or until firm enough to roll into balls. Remove from the refrigerator and use your hands to roll the chocolate into 10 half-tablespoon balls. 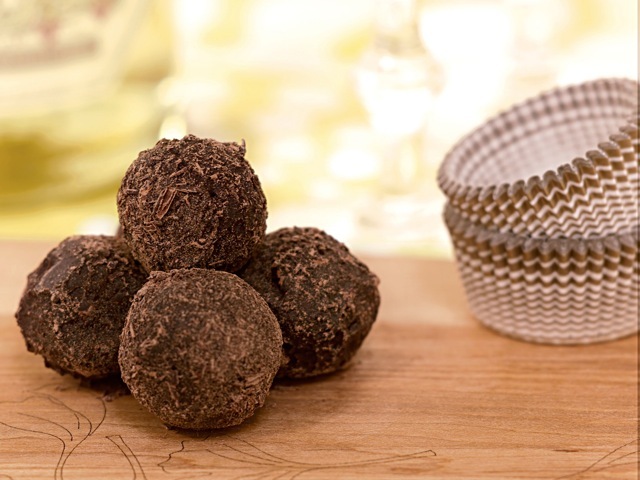 Roll the balls in cocoa to cover and place on a parchment paper–lined plate or baking sheet. Let soften at room temperature for at least 20 minutes before serving.